The third offensive mounted by the British, during the battle of the Somme, was significant because it was the first use of tanks in warfare. The Mark I tanks were not ready for the first Somme offensive in July. But two and a half months later, when they did arrive, Haig quickly incorporated them into the 4th Army plan of attack. On 15 September the 47th Division attacked High Woods, along with the four tanks allotted to the Division. Three tanks reached the south end of the wood, but two of them turned east, hoping to find more open ground. One tank drove directly into the woods and fired on the Bavarian Infantry Regiment 18. The advance continued through the wood, supported by mortar teams that fired a barrage against the last pockets of German resistance. By 1:00 PM, the wood was surrounded and the Germans began to surrender. 2 Medals for each British Mark I tank eliminated. 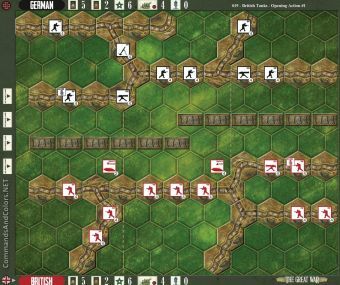 The British forces gain 3 Temporary Victory Medals at the start of their turn, when there are no German units occupying any trench hexes that surround High Wood. 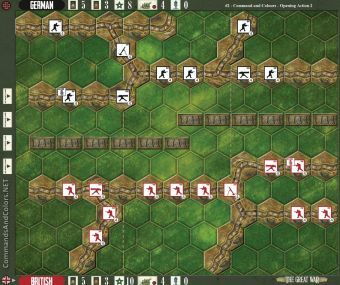 The British forces gain 1 Temporary Victory Medal at the start of their turn, when one or more units occupy any German Switch Trench line (very back line of German trench hexes). The British tanks are Mark I tanks. Use the Mark IV tanks as stand-ins. Just played this one yesterday with a friend of mine (live). British player (me) took it too slow and German player got the victory with 3 Recon Cards during the entire game (Racing agein time rules). Maybe I should have pushed Mark I tanks a little more (they didn't even reach German first line trenches).